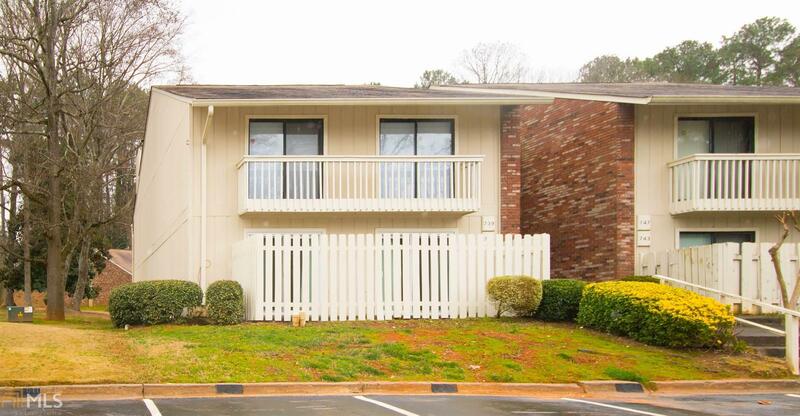 Great one level living in this 2BR/2BTH condo in highly desirable Powers Ferry area of Cobb County. Easy care flooring with ceramic tile and laminate flooring. Spacious bedrooms, large walk in closet in master. This ground floor unit has three sets of sliding doors that open to fenced patio areas. Back patio has convenient ramp. Large kitchen with white cabinets, subway tile backsplash & large pantry, including handy breakfast bar. Painted brick wood burning F/P. Exterior storm door, 6 panel doors, coat closet, two outside storage closets and large fenced patio off great . 2" Wood blinds, antenna for air TV and signal booster. Community has clubhouse, pool and tennis court. Convenient location is close to interstate, shopping and restaurants.